NHS England Workforce Race Equality Standard report shows continuous but slow progress in employing black and minority ethnic nurses at senior levels. 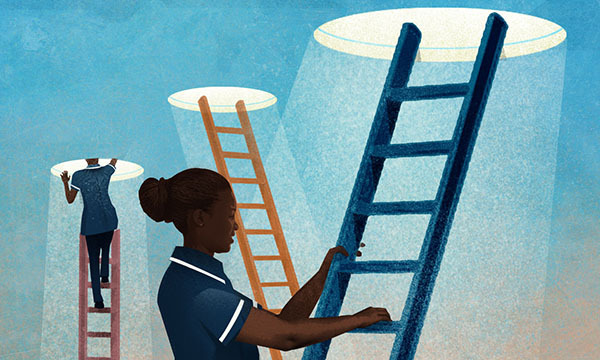 Black and minority ethic (BME) nurses are still facing ‘an uphill struggle’ for equality, says the RCN, despite latest figures showing some progress is being made to reduce discrimination. The third annual NHS England Workforce Race Equality Standard (WRES) report shows an increasing number of senior nursing and midwifery posts are being filled by people from BME backgrounds and notes a rise in the number of senior BME leaders. But it also highlights that, although one in every five nurses and midwives is BME, they remain significantly underrepresented at senior manager levels and from band 6 upwards. In 2017, one quarter of all BME nurses and midwives are at band 5, but the new data show a pattern of continuous progress and an increase in the number of BME nurse in bands 6-8 between 2016-17. For example, there was an increase of 1,347 BME nurses and midwives (6.8%) at band 6, and an increase of 439 of those at band 7 (6.4%). RCN England director Tom Sandford said employers need to take robust action: ‘There can be no room for racism across the health and social care sector, and certainly no place for it in the nursing profession. ‘This report provides further evidence of the damaging impact of discrimination on the careers of BME nurses and healthcare support workers. Chief nursing officer for England and senior responsible officer for WRES Jane Cummings said: ‘I am happy that, for the second year in a row, there is evidence of some continued improvement in the WRES data of some trusts and that we have seen a sustained increase in the number of BME nurses in senior posts. Professor Cummings said: ‘There is still a lot to be done to ensure we see more BME nursing and midwifery staff taking on more senior roles. White shortlisted job applicants are 1.60 times more likely to be appointed than BME shortlisted applicants. BME staff are still 1.4 times more likely to enter the formal disciplinary process in comparison to white staff. BME staff remain significantly more likely to experience discrimination at work from colleagues and their managers compared to white staff, at 14% and 6% respectively. There is an increase in the number of NHS trusts that have more than one BME board member. In total, 25 NHS trusts have three or more BME board members - an increase of nine trusts since 2016. NHS England chief executive Simon Stevens said: ‘Building a more representative workforce is good for hard working NHS staff, and for the diverse patients and communities we serve. ‘As the largest employer in Britain and one of the biggest in the world, the NHS has a particular duty to be fair and supportive for all our employees.